Blaise Castle on the northwestern outskirts of Bristol has one direct and several indirect links with Jane Austen. Its name has been made famous by Northanger Abbey (though incorrectly spelt therein with a z) and its history provides a fascinating insight into the cult of the Picturesque, which impinges on all Jane Austen’s novels. The Blaise estate adjoins the downs of Kingsweston, where, (how can we forget?) the Sucklings have twice ventured in their barouche-landau. The Sucklings lived “near Bristol,” and to drive to Kingsweston was not unreasonable; but Isabella Thorpe makes it her goal from Bath. Since Kingsweston and Blaise are quite on the other side of Bristol from Bath – a good twenty miles away altogether – she deludes herself about the possibility of getting so far and back in one day, especially in February, and in a pair of gigs with one horse apiece. James Morland, despite his infatuation for Isabella, expresses his doubts. He has unwittingly pronounced the one word which can tempt Catherine. Blaise Castle thus plays its part in forwarding the plot of Northanger Abbey and illustrating the characters of the Thorpes and Morlands, without Catherine ever seeing it. Jane Austen could not let her do so, for her disillusionment would have forestalled that which she is to experience at Northanger Abbey itself. The reality of Blaise remains a private joke between Jane Austen and her readers in the know. Catherine never discovers that far from being “the oldest in the kingdom,” Blaise Castle is in fact a mere eighteenth-century folly. It was famous enough in its time for Jane Austen to depend on her readers relishing Catherine’s ignorance. Today, perhaps, for a greater enjoyment of the novel, the history of Blaise requires to be told. In 1762 Thomas Farr, a Bristol merchant whose fortune came from the transatlantic sugar trade, purchased the estate of Blaise, consisting of 400 acres of mainly hilly, wooded ground, and a rather modest house standing on the very edge of the property, as close as it could well be to the parish church and small village of Henbury. To the side of the house was a formal garden, whilst behind it the land rose steeply to reach the highest spot on the estate within a few hundred yards. 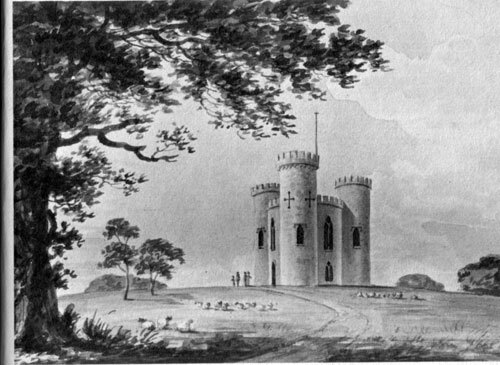 Blaise Castle, a watercolour by Humphry Repton from his Red Book for Blaise,1796. “Smith’s place is the admiration of all the country: and it was a mere nothing before Repton took it in hand. I think I shall have Repton.” Mr. Rushworth, Mansfield Park. This hilltop had been the site successively of an Iron Age fort, a Roman temple and a medieval church dedicated to St. Blaise (the patron saint of wool-combers), the last ruins of which had been removed in 1707. It was possibly regret for this act of insensibility which inspired Farr, in 1766, four years after taking possession of his estate, to build a “castle” on the very same spot. He paid Robert Mylne £3,000 to design and build a folly that was habitable, as he wanted to use it as a retreat for meditation, as well as a vantage point from which to survey the Avon and Severn valleys, and a picturesque object to be glimpsed amid the trees from the windows of his house. The design features three ornate castellated turrets, one of which contains the staircase giving access to the flat roof of the central, lower tower. Traceried windows and cruciform arrow-slits supply the Gothic ornamentation, while stained glass and elegant interior plasterwork supplied the comfort. There was a vestibule and dining room below, and a main chamber above. Altogether a far cry from the castle of Catherine Morland’s imagination! Thomas Farr went bankrupt in 1778 as a result of the American War of Independence, and was obliged to sell Blaise. Under the new owner, Denham Skeate, the retreat for meditation became open to the public, who flocked to enjoy the views. One famous visitor was JohnWesley, who in 1788 set out at six one morning from Bristol expressly to see the castle, recording in his diary, “Mr. Farr, a person of exquisite taste, built it some years ago on the top of a hill which commands a prospect all four ways nothing in England excells.” Praise indeed from such a well-travelled man. Perhaps Catherine would not have been disappointed, had she been able to visit it with the Tilneys to point out what was and was not picturesque about the view! The property changed hands again in 1789 when it was bought for £11,000 by John Scandrett Harford, a Quaker banker and father of a large young family. In him Blaise found a fitting owner, whose greatest delight was the current passion for “improvements.” Until his death in 1815 he played happily with his estate, sparing no expense and employing the most famous names to advise him. His first step was to pull down the old house and build the present Blaise Castle House nearby. Work was begun in October 1795 and by the following October the roof was on, in celebration of which seventy workmen were treated to a dinner, with a gallon of ale each, at the local inn. Designed by William Patey in the classic Georgian style, the main house is solid and sober, catching none of the Gothic fancifulness of its small neighbour. Over the years, offices, stables and an orangery were added, the last, which imparts some delicacy to the house, the work of no less an architect than John Nash. A pretty thatched dairy was his invention to fill the spot where the original house had stood. Repton abolished the old formal garden (though a delightful small walled garden remains between the house and the dairy) and ordered the felling of seven sixty-foot elms from an old triple avenue. How Fanny Price would have mourned! Blaise Hamlet, exquisitely preserved and still inhabited, is now owned by the National Trust; the remainder of the Blaise estate is administered as a public amenity by Bristol City Council, which has created a Museum of Rural Life in the house itself. Blaise Castle, after falling into disrepair, has now, with the help of the Friends of Blaise, been made safe, and it is hoped ultimately to refurbish the interior. Meanwhile the staircase once again takes visitors to the roof to enjoy the view, which reaches beyond the modern sprawl of Bristol to the Welsh hills. For those planning a Jane Austen pilgrimage to include Bath, it is worth sparing a day to visit Blaise. The drive can now be accomplished in less than an hour, so you are likely to be more successful than the Thorpes and Morlands! From Bath take the A4 west through Bristol and towards Avonmouth. About two miles after passing under Brunel’s famous Clifton Suspension Bridge, turn right at traffic lights (signposted Westbury-on-Trym), straight across at the next lights, left at the next and left at the next again (signposted Blaise).